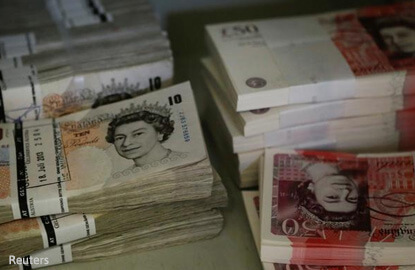 LONDON (Feb 17): Sterling sank to a 10-day low against the euro on Friday after a surprise third monthly fall running in British retail sales pointed to weakening consumer sentiment as the government gets ready to launch talks on leaving the European Union. Shoppers have driven a relatively robust performance for Britain's economy since last June's Brexit vote but showed sales volumes down 0.3% month-on-month in January — much weaker than economists' forecasts in a Reuters poll for a 0.9% increase. Those were just the latest signs of fatigue among households facing the impact of a 20% fall in the value of sterling and rising fuel prices after a recovery in the global price of oil. Sterling hit its lowest in 10 days against the euro, down almost 0.5% on the day at 85.82 pence. It fell to a one-week low of US$1.2388, down almost 1% on the day. "After surprisingly weak numbers in December, sales figures for January have taken another turn for the worst and analysts believe more troubling times lay ahead," said Paul Sirani, Chief Market Analyst at online broker Xtrade. "Retail was the beating heart of the UK economy in 2016, so with consumer spending expected to slide in the coming months we could see the pound push lower against both the euro and the (US) dollar." The moves come after sterling's best run in over four months against the euro and signs that leftist parties could unite behind one candidate in France's presidential election in April weakened the euro further against the US dollar on Friday. But after a generally more robust couple of months, many bank analysts are again predicting losses for sterling in the weeks ahead. "The looming Brexit issue casts its big shadow over the pound and it’s always going to impact on sterling’s fortune until we get an idea over how the whole thing is going to pan out," ETX Capital's chief FX Broker Richard Wiltshire said. Brexit minister David Davis said this week that government was on course to meet its end-March deadline to launch the formal divorce procedure from the EU but did not see Britain doing so at an EU summit next month.